Is your team struggling to get started with chatbots? Afraid you're falling behind the competition? Apps like Facebook Messenger offer marketers like you unprecedented access to billions of active, daily users. Combined with AI-powered chatbots, they've created spectacular new channels to connect, nurture, convert, and up-sell customers. In fact, according to HubSpot, 47% of consumers would buy items from a chatbot, but, let's be real -- chatbots can be ridiculously hard to build. 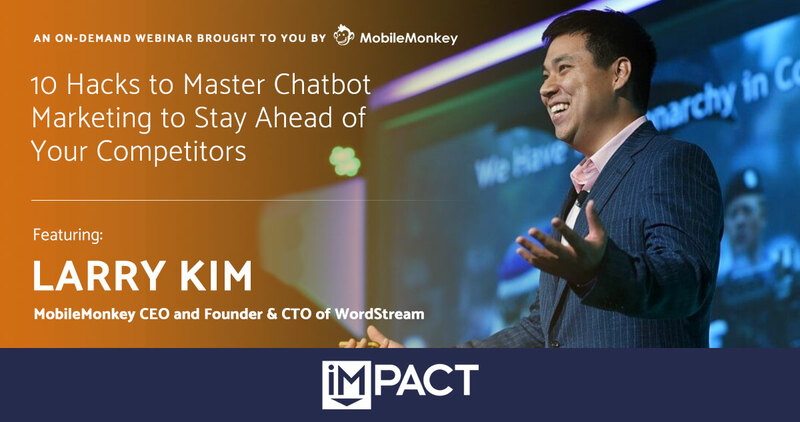 In this exciting live webinar, MobileMonkey CEO and Founder & CTO of WordStream, Larry Kim, dive deep into the nuts and bolts of building useful Facebook messenger bots, exploring use cases like content promotion, appointment booking, or customer service (and how to drive people into those messenger funnels), and even how to use chatbots to turn a profit. Whether you're a marketing agency, a SaaS company, or a small B2C or B2B business, you walk away with actionable steps to get your chatbot strategy not only started, but thriving! Larry founded MobileMonkey in 2017 after seeing the need for a product that enables marketers to engage with customers via mobile messaging platforms. He assembled the founding team, raised a seed financing round and today focuses on product and marketing strategy. Prior to MobileMonkey, Larry was the founder and CTO of WordStream, the World’s leading provider of PPC marketing software, employing hundreds of people and managing approximately a billion dollars for thousands of customers worldwide. Larry was named “Marketer of the Year” by Search Engine Land, the US Search Awards, and PPC Hero. He studied Electrical Engineering at the University of Waterloo, in Canada and has a 3-year old kid. Fill out the form, and you'll gain access to the slides and recording of the webinar!